Avengers: Endgame is gradually drawing nearer and speculation focused upon the associated sets has been growing during the last couple of weeks. 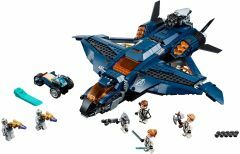 Amazon.fr and Amazon.it have now published official images of two sets from the upcoming range, 76124 War Machine Buster and 76126 Avengers Ultimate Quinjet. Are you impressed with these Avengers: Endgame sets? Let us know in the comments. News via Brick Heroes and The Brick Fan. Considering these sets and the others that are rumored, this may be the first Avengers wave that I get every set. Love how over the top the War Machine Hulkbuster is, and the Quinjet looks very similar to the original Avengers version. Also those updated Chitauri look great! @Guyon2002 it's because of all the secrecy that the Russo brothers and Kevin Feige have, claiming footage will show the first 20 mins to avoid spoilers, so will likely see the same. because these sets would release before the film so it is in spoiler territory. Huge pass on both of these. Generic suited heroes I already have scads of multiples of and yet another Quinjet and Hulkbuster? No thank you. Hopefully the rest of the theme will feature interesting 'flashback' sets from all over the MCU, offering up interesting costume variants and models that we didn't see the first time around. I never bought any of the Quinjets previous, and I'm not likely to start now. OTOH, I do like the War Machine version of the Hulkbuster suit. That's tempting. I, too, hope that there won't be major spoilers, for the movie, in the Lego sets. Lego has a *bad* habit of doing that, right the way back to the original Harry Potter movie. Not a fan of the minifigs in those white suits. That War Machine set shall be mine. That Quinjet looks really good to me!!! That new Quinjet design looks interesting. Good selection of figs and that little trike to boot. Hope there's a good interior. Might just get this variation of the hulkbuster build as my first. @SD449: the new teal coloured brick separator is turning up in ever more sets now (70825, 70831, 75975, 80102, and now this 76126), so I guess it'll probably replace the orange one completely sometime this year. And while I'm not into the Superhero theme, that Jet looks like a cool build. @Zordboy, how could Lego spoil the first Harry Potter movie? The book was out for 4 years before that movie came out. I'm hoping the teal brick separator gets in more sets, but it seems random which set gets which color. I love this quinjet, it's really nice looking. However how many do children need? Maybe this is why Super Heroes weren't in the top 10 themes. It's not a surprise that they contain only caracters who didn't go dust at the end of Infinity War. Finally, a more accurate closed faced helmet for Ant-man! The sets look decent, but as others have said, I don’t need another quinjet (although this one does look better than the previous versions). And I don’t need another giant iron mech. Plus the point of these blockbusters is to sell toys. Interesting that they would all share the same uniform. I’ll likely pass on these, but they do look nice. YES! Antman finally has an accurate helmet piece. Looking forward to seeing what the future sets hold. I like them but don’t love them. Meh, I and my wallet are thankful that I will save on these sets though I so want a cheap set with the Chitauri to complete Thanos army. I need that weird green brick separator for my collection. The sets look great and they are tempting for me to buy them. Awesome! I can never have too many Busters or Quinjets, so LEGO will have my money. Looking forward to the remaining End Game sets! the quinjet is very tempting, glad i hadn't bought any of the earlier versions. just hope it isn't too expensive. I would think the first 30 minutes of the movie will cover the post-snap environment, and perhaps Scott Calvin showing up with an idea of how to fix it. I don't see them getting from concept of time/quantum realm travel to re-fighting old battles in 30 minutes. The Russo's don't have as much control over merchandise agreements as they do over the films. Nice to see a "regular" sized quinjet after the pathetic Captain Marvel set. Is that not Hawkeye right there? Why does it not say he comes in the set. Or is it another name for him or not him? I don’t really follow this stuff. @Your future president: Yes, Hawkeye is Ronin. It's an alias he used in the comics after "dying" and one he'll use in Endgame for reasons I won't disclose if anyone reading this wants to remain 100% spoiler free. As for the sets, I need every set from Endgame, regardless of how good they are, and these don't disappoint me (though the white suits are a tad jarring). That Hulkbuster looks sweet! It just needs some mods. I have to get it, especially since LEGO have FINALLY made a new helmet mold for Ant-Man! Or not. I'm pretty sure that piece was in he Batman Mech set. On taking a closer look, it is horrible. Even the old one with he open mouth looks better. Come on, LEGO. I guess I can only hope that the others will be cool. I thought the Infinity War series was phenomenal. The use of the stones as a way to connect all the sets was brilliant marketing strategy, but overall I thought the sets themselves were pretty awesome. The Benetar ship with the detachable pod from a separate set...genius and I think I really great build. The black panther wall was not movie specific, but the concept was great and well executed I could see people buying multiples and creating really great MOCs. The Hulkbuster in that medium size....perfect!The grand prize sanctum sanctorum was as well done a build as I've done in the last few years and a really reasonable price IMO. The only meh set in the whole thing was the dropship. I hope that the End Game series is as strong. I like the war machine hulkbuster for sure. I have a quinjet already, but this one looks bigger and more detailed so might be worth still buying. I would be very disappointed if the next 3 sets dont' pull my interest because from the second I saw the infinity war series I knew I needed them all and it felt rewarding to collect them all. I will withhold judgement till I see them all....but so far these two images dont have me planning to buy all the sets. If the other three are fire Ill get the quinjet, if they are weak I might only end up getting the hulkbuster. I'm glad to see that these are finally official. I've been waiting since they leaked on youtube around a month ago along with the Captain America set. My guess is that the other two contain more spoilers on the movie, so Disney doesn't want those revealed until the last possible moment. With a suit like that, Rhodes should finally have an impressive war machine story! Interesting how they've all got consistent outfit designs. Not a total fan of it (I'm bad with faces, the outfits often help me tell people apart in long shots) but it's pretty cool idea and brings some cohesion to the team! I feel like, in order to convince me to buy these sets, Lego is gonna have to really stun me with the builds themselves, and these ones aren’t doing it. I might pick up the hulkbuster, but I think it’s a pass on the quinjet. Let’s hope the rest of the wave is better. Wow, everyone has the same torso and legs. Lame, Lego. Very lame. Is that supposed to be Black Widow in the Quinjet set? Where is her blonde hair? Quinjet looks nice, and I don't follow Movie/Superhero sets that much. @JDC: "Scott Calvin showing up" ??? For everyone criticizing the same white outfits, you should wait for the movie; or take a look at any of the spoilers that are out there. It will make a little more sense. Wow.. I love the ultimate quinnjet and the war machine mech but is, nt there meant to be a captain America motorbike? And im so glad the chitauri and outriders are in the same film.. Now we just need to see the fantastic four in lego form and Daredevil.. The Quinjet is becoming the new Millenium Falcon, a new one every year, except no one wants another Quinjet. @mrforcepower The Chitari in the Quinjet outrule that. Distinct yet uniformly-dressed operatives for good, who own a futuristic dark blue vehicle and represent their enterprise with a capital A? The Quinjet looks pretty nice, but the Avengers all have the same torso and legs, not even female / male versions? That might be a reason for me not to get it, as I want all the elements in a set to convince me, there is just so much to chose from these days..
War Machine mech is alright, I guess, same outfit problem here again. Last year's IW sets I was like "damn, I need them ALL". And so I bought 5 out of the 6 sets. Now I'm like "well, money saved. Two less sets I'm buying". One cool thing about superheroes is their colorful suits. Here they're wearing the same boring white suit (and we know there's also a set with Captain wering it too). Let's hope the set with Thanos worth it. Anyone have info on when they will be released in the US? Love these. I like having all the different Quinjets for my Avengers base in my LEGO city and this one looks great. And never enough Iron Man/War Machine variants for the "Hall of Armour". And great having a new brick separator colour! does anyone know the prices for these? they look pretty cool. I think these are a fine and worth effort on LEGO's part; I'm not mystified by other fans' lack of interest, but certainly can we blame LEGO if the characters all wear boring suits in the movie? I may or may not buy the Quinjet, as it looks a lot better than the AoU and CW variants. They look to be fairly good sets held back by source material. I hope we see the other 2-3 sets soon. White suits, that can mean only one thing. Quantum realm time travel to beat thanos. Do we know roughly when these will be released? All the Endgame will be coming out on March 31st. Just confirmed it with my LEGO store. It's a shame that these have to be announced before the movie... I guess the only way to truly avoid all movie spoilers these days means avoiding LEGO news as well. That Quinjet looks better than any before it. Will definitely be getting! antman wear ironman suit can still change small? or wear antman suit inside, wear ironman suit outside? why thor need to wear ironman suit? he can already fly and stay in space.